This is the best advice I have heard for getting involved in a knife fight. The 2nd is if you do, be prepared to get cut because you will. If you have no other choice but to fight unarmed, then go for control of the arm with the knife and grappling, using and arm bar to disarm or break the attackers arm. 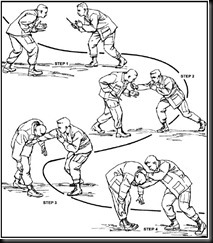 The Army Combatives FM (pdf) explains how to do this depending on the angle of attack but in reality a knife attack is awfully unorthodox and hard to predict. Its about speed and strength. Getting control of that arm and disarming the opponent as quickly as possible. Maybe some other good advice would be to have a small Indivdual First Aid Kit (IFAK) with you. This entry was posted in Security and tagged First Aid, IFAK, knife, self defense by paadmin.Bookmark the permalink.